Going from under the radar to on the radar, Everything Everything are looking forward to being a part of the NME Awards Tour this month. We had a chat with lead singer Jonathan Higgs on the bands success and future dreams. We’re rehearsing, we just got a lot of new outfits for tomorrows show and for the whole tour. So we are putting them on and playing songs…. We’re not rehearsing putting them on, I mean we’re rehearsing our songs with the outfits on. We just got to our studio and we’re laughing at each other. What sort of outfits are you wearing? Its like a workmans sort of boiler suit thing. It’s weird. We kinda wanted to look like we were doing a job, a bit like we were doing the same job and we wanted to feel like the outfits were on to do this particular job. Its got all these little things on it to help us, like a few cables and a few pockets to put our picks in. Stuff like that. How much of a privilege is it to be asked to perform at the NME Awards Tour? It’s a big privilege yeah. We done one last year for The Radar Tour and now we’re back for the big one. We didn’t know it was going to happen and it came out of the blue. Yeah its great. Yeah, we definitely like the other bands. Magnetic Man are great, I’m loving their new single and I’m looking forward to seeing them and seeing what they do because obviously they are different to us. We’re going on tour with all of these bands who are completely different to us. I’ll definitely be keeping my eyes open for them. I think its great that there is so much variety. When we first see a new band its like whoa, and new experience changes your perspective. It opens people up to a lot things rather than just guitars and drums and they’re gonna end up with something completely different. More people will get exposed through this. We were playing around with the word ‘Everything’ and we really liked it. Its got a nice rhythm and its obviously got a neutral meaning. We were wondering how to combine it with another word. It became an impossible potential task and that’s what we really liked about it. It kind of an impossible complex to make one ordinary word into something big. Impossible, but we liked it. Who were your influences when creating your sound? We’ve all got different influences, a bit of a mixture. Grunge and House Rock from our pasts. That’s really our bread and butter. Since then we listen to really a lot of different stuff like Jazz and R&B like Destiny’s Child. Producers as well, we’re just big fans of sounds like Hip Hop and Electronic sounding music. Its all so important in music itself to some people. How long did your record ‘Man Alive’ take to make? Erm, I don’t really know because it took a month to record it and then months and months and months of mixing and adding things and changing things. So it took us up to May until we knew it was definitely done. But that wasn’t recording, just tweaking. Was there a lot of problems making it? We went there with 13 songs and we ended up writing 2 songs while we were there. So we weren’t quite sure what to put on the record and whether to take a song off to put that song on, how long it should be, in what order should the songs be, how should it sound. Its like 6,000 decisions that have got to be made and they have to stick when you make them, you can’t take them back. So its really stressful basically, especially if you have 5 or 6 different lines on a song and everyone has their own opinions. The way we record it is a bit scary because once its out there, its out there. You can’t really edit things, we’re sort of perfectionists. Your artwork on the record is amazing, the best I’ve seen in a long time. Who’s idea was it to create that design on the cover? One of the songs on the album is called Tin which is about a fox going to the city and its sort of growing and eating up thorns which is quite surreal stuff. We really just liked the misery on the lyrics basically and we thought it would be cool to make a video of this. It didn’t work out so we thought why don’t we put in on the album cover and base all the artwork on this idea of a fox in the city at night. We worked with these two designers and they wanted to put some glitch elements on it which is like when a photo gets downloaded somewhere and it fucks up and you get these big sort of gashes of colour and it looks like its gone wrong. Like when your TV messes up. So we got all these images of this fox that we just found from a random photographer who we later found out we knew the guy who took the photos. And then we change the code so the photo would get the glitches in them. Its sort of like how your music and your album cover are linked of being a bit wacky, its sort of symbolic. Yeah, we like the fact that its sort of a natural wild animal in the middle of an urban place which is a little bit weird for it to be there and then the whole image to be digitized and that’s gone wrong as well. So its like a digital invasion of the natural creature that’s wondered into a town. It’s a very surreal thing anyway. When you see a fox, its really weird because they’re completely wild but when they pop up next to Top Shop or whatever its quite a cool little bit of nature. Getting its own back. You’re currently set to finish touring in May. Are you set to add some more dates? I’m not sure. We’re talking about doing some shows in other countries, maybe some more UK shows. Got some plans just before the summer and obviously doing all the festivals. So yeah, watch this space. What are you hoping to achieve with your second record? Bigger and Better? Yeah I think so. I think we learnt a lot making it and we learnt why things are good and why things are not. I think we just want to make something better and stronger, I personally want to make it more classic or timeless. I don’t know how you can do that but I want it to be songs that can be performed by other people, not just someone with a silly voice like me. Perhaps more direct. Some bands come up with an idea while they’re on tour and start producing it there and there. Is that something you guys do or do you wait when you finish your tour then go into production? Well right now we are getting ready to go on tour so we’re not even at that stage. I don’t see why not when we get an idea but it will be very hard to do. You can’t record drums on the road. We do a lot on our laptops anyway, that’s primarily writing anyway and that’s easy to do anywhere. So we are writing the whole time. I really into Drake album. Its like a new producer in every song and half of it is really amazing with its sort of ridiculous production. I’m really interested in the atmosphere of it. I would probably go to Neverland, Michael Jackson’s house. To see what the hell is going on in there and I‘ll see what I can find. If you could have pool filled up with anything, what would it be? Yeah well the fact that we got these ridiculous grey boiler outfits, no one else knows that. We kept that quite until now. We are going to look absolutely ridiculous on this tour (laughs). What do you dream to achieve in the future? Stay in a band, its getting increasingly hard to do that I think for everyone. It will be great to still be making music and the music I want to make for as long as I want to do it. That’s what I hope to be doing. 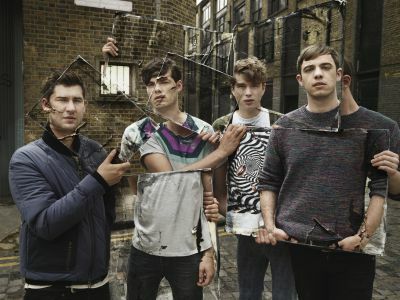 Everything Everything's debut album Man Alive is out now.